The 2012 Volkswagen Tiguan and 2012 Kia Sportage are both on sale now. If you are considering a sporty compact SUV, it is worth doing a Volkswagen Tiguan vs. Kia Sportage comparison to determine which vehicle better fits your needs and budget. 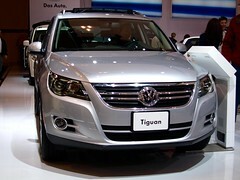 The Tiguan receives a mid-cycle refresh for 2012 in its fourth model year. While the changes appear subtle, the Tiguan is an improved vehicle in 2012. 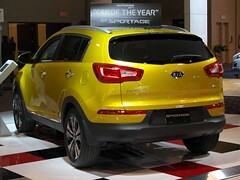 The Sportage was all-new for 2011. Both models have been a success for their respective makers. The Tiguan has already sold more than 700,000 units since its inception. Even though the Tiguan carries over its 2.0-liter 200 horsepower turbo-charged four-cylinder engine from 2011, VW engineers have made changes to the gearing and torque converter to wring out more fuel efficiency from the engine. Fuel economy improves in the Tiguan to estimated EPA fuel economy of 22-mpg city and 27-mpg highway with the six speed manual and 18/26 with the six-speed automatic transmission, a 15% improvement over the 2011 model year. Other Tiguan changes for 2012 include a new steering wheel, a more quiet and comfortable interior, a better suspension, and a more aggressive and upscale exterior appearance. Top trim models now have 19-inche alloy wheels and LED daytime running lights. With 53.3 and 54.6 cubic feet of cargo volume with the rear seats folded, the Tiguan and Sportage lag many of their compact SUV competitors in terms of cargo room. The Subaru Impreza hatchback has 49.7 cubic feet of cargo room. The Honda CR-V and Toyota RAV compact SUVs each have more than 72 cubic feet of cargo room. However, the Tiguan does allow the front passenger seat to be folded flat unlike many of its competitors. This allows it to accommodate loads up to 8.2 feet long. With its turbo-charged engine, the Tiguan is a bit quicker than most of its competitors. However, the turbo-charged four-cylinder Sportage SX model dwarfs it in terms of power returning 260 horsepower in a 2.0-liter engine, 60 more than the Tiguan. 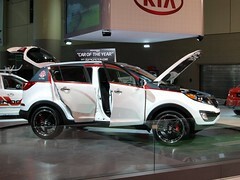 The other Sportage trims offer a more efficient 2.4-liter 176 horsepower four-cylinder engine. The Sportage SX has a 0-60 time of about 6 seconds where as the Tiguan has a 0-60 time of about 8 seconds. The Sportage also gets better EPA estimated fuel economy of 22-mpg city and 29-mpg highway with the six-speed manual 21-mpg city and 26-mpg with the six-speed automatic transmission. The Tiguan is the decidedly pricier of the two models. The 2012 Sportage has a starting MSRP of $18,500 while the 2012 Tiguan starts at $22,840. Even the top line 2011 Sportage SX started at $27,295 with sunroof, leather seats, heated front seats, air-cooled driver’s seat, and navigation being among the added options. The Tiguan’s price can approach nearly $40,000 with the top SEL trim with added options. A Volkswagen Tiguan vs. Kia Sportage comparison shows the strengths and deficiencies of these two compact SUV models. Other competitors include the Nissan Rogue, Hyundai Tucson, and Chevy Equinox. Which Compact SUV Model Do You Prefer? My main complaint with both the Sportage and the Hyundai Tucson is there are no heat/ac vents for rear passangers ? I really like both vehicles but I have a giant breed dog and the lack of rear a/c vents I consider a deal breaker.